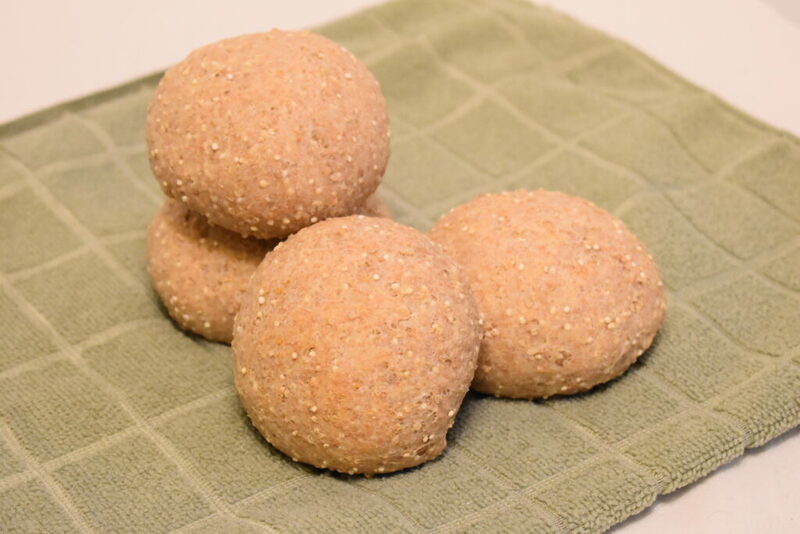 If you are looking for a hearty sandwich roll that is delicious and healthy you’ll love these quinoa rolls. They are perfect for sandwiches, burgers or with soups or salads! I love a great sandwich on a nice thick roll. I try my best to eat whole grain breads and rolls as much as possible, but I’ve found that the selection of buns that are whole grain is pretty slim. Enter in these quinoa rolls. 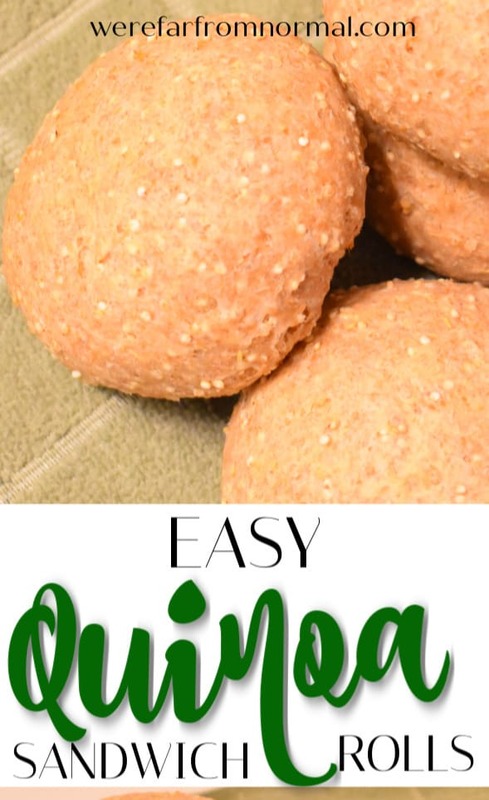 They are chock full of delicious healthy quinoa and are incredibly easy to make! 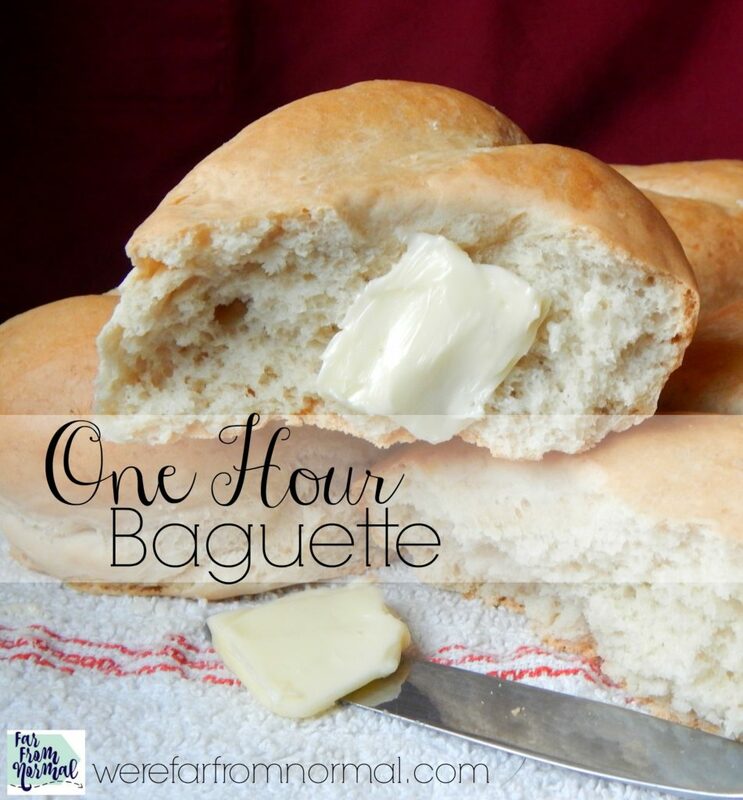 They come together really easily, bake up in less than an hour and are so so good… they’re pretty much the perfect roll! I love them for burgers, sandwiches, even for breakfast with a nice scrambled egg and a little cheese! In a stand mixer fitted with a dough hook (or by hand if you’re strong) Combine all ingredients. Let it mix for 5 minutes or until the dough is smooth. If it seems a little sticky add additional flour a Tbsp at a time. When it is done mixing cover with a towel and let it rise for 15 minutes. Don’t be alarmed that this dough doesn’t rise a lot, it’s not one that will double in size. Cover and let them rise another 20 minutes. 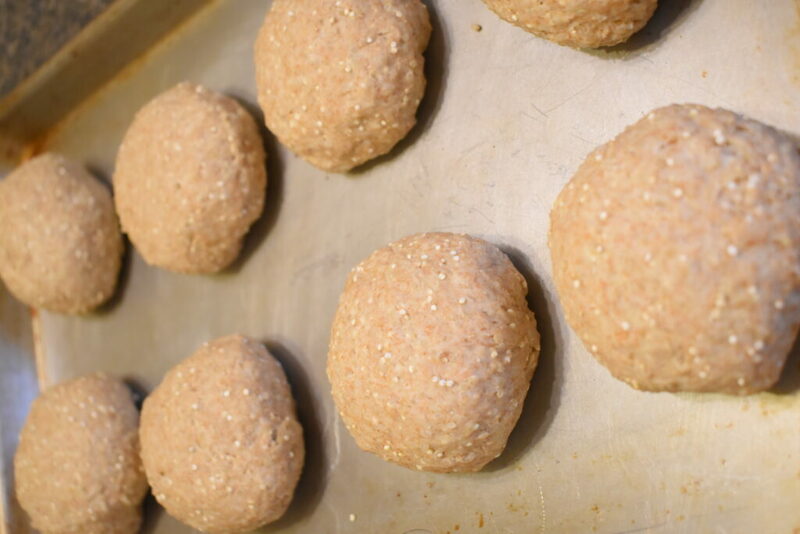 Pop them in the oven for 15 minutes or until they are golden brown. Easy, delicious and healthy! What more could you ask for?? 1.In a stand mixer fitted with a dough hook (or by hand if you’re strong) Combine all ingredients. 2.Let it mix for 5 minutes or until the dough is smooth. If it seems a little sticky add additional flour a Tbsp at a time. 3.When it is done mixing cover with a towel and let it rise for 15 minutes. 6.Cover and let them rise another 20 minutes. Sounds very good! I am obsessed with quinoa! Me too! It is one super healthy thing I can get my boys to eat with no argument. 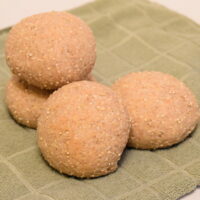 These are great & easy as far as bread goes! Enjoy!! I use quinoa in EVERYTHING!! I am definitely making this! I make all of our bread now and having a new option would be appreciated by everyone!!! Thanks for visiting the Hump Day Hop! I am following and can’t wait to read more! Hope you like them! 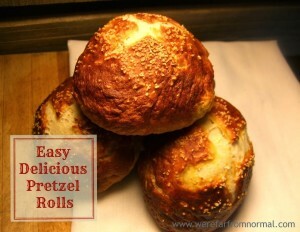 I love to make our bread & these are so easy! Thanks for following! oooo, these look really good! Thank you for spreading JOY and sharing at the Oh What a HAPPY Day party. I love quinoa, I’m going to have to give this a try soon! I’m a new follower by way of Oh What a Happy Day Party. Have a good day! This looks so good. I have been reading about quinoa for a while now and just bought it for the first time last week. I am def. adding this to my list of quinoa recipes! Once you get started cooking with it you’ll love it! I have more great quinoa recipes so be sure to check back! Thanks for stopping by and following!! Let me know if you like them! I’ll be sure to stop by and visit you! These look so delish!I must try! I am going to try this, I’ve heard a lot about quinoa lately………..Thank you for sharing with the Clever Chicks Blog Hop this week; I hope you’ll join us again! Come back and let me know if you like them! I’m a big fan of quinoa, its so versatile, hope you like these! Hello, I am in a constant quest for good gluten free sandwich bread. I like quinoa and yours looks good but kitchen/baking magic being somewhat capricious, do you think I could swap your 3 cups of flour for a gluten free variety?